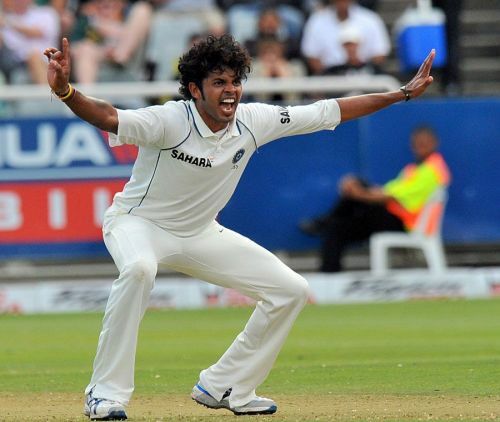 Shanthakumaran Sreesanth was born on the 6th February in 1983 in a town named Kothamangalam in Kerala which lies on the foothills of the Western Ghats. He burst onto the scene in 2002-03 before making his international debut in October 2005 in the ODI series against Sri Lanka. A few months later, he made his Test debut as well and soon became a regular in the Indian team across formats. He was also a part of India’s World T20 triumph in 2007 and also the World Cup in 2011. He played international cricket for more than five years (2006-2011) before injuries plagued his career, and just when he was on the verge of making a comeback, he was involved in the 2013 IPL spot-fixing scandal. Since then, he has been banned for life by the BCCI. However, Sreesanth did have plenty of moments which he and his state Kerala can be proud of. Here are some of those moments. India’s tour of South Africa in 2010-11 was off to a disastrous start. They were humbled by the hosts in the first Test as they lost by an innings. They were off to a poor start in the second Test as well. They were bowled out for 205 in the first innings. However, an inspired show by the bowlers brought them back in the game as the Proteas were bundled out for 131. In the second innings, VVS Laxman’s 96 helped India set the hosts a target of 303 in the fourth innings. South Africa started the chase well as the openers put on 63 for the opening wicket. Sreesanth, who had picked up the wicket of AB de Villiers in the first essay, produced the initial breakthrough. He had South African skipper Graeme Smith top-edging a short ball straight to MS Dhoni. He then got the big wicket of Hashim Amla a few over later. Sreesanth then produced a snorter to dismiss Jacques Kallis as his three-wicket burst put India in the driver’s seat. His 3/45 opened up the game for the visitors and India capitalized and won the Test match.